First off, thanks to all of you who showed up to the The Watcher Storm Hawks Signing Event at the Beaches Jazz Fest. We had a great time! Thanks to Jaime Antonio, Marvin Law, Marvin Mariano, Marcio Takara, and Craig Yeung for sparing some of their precious time. - Unfortunately, I will not have Crozonia #4 ready for Fan Expo Canada (August 28-30). Between Storm Hawks production work, more Bakugan Freelance, and buying a house, I just couldn't get it done. I'm going to try to finish it up this year. Thanks to all the fans who have waited patiently for Crozonia #4. - Storm Hawks / Nerd Corps Entertainment will be at Fan Expo Canada! More info to come shortly. - I will be at Chicago Comic Con (Formerly Wizard World) August 6-8. I will be selling the Storm Hawks Special Edition, Crozonia, and The Art of ReBoot. I will also be sketching and taking on drawing commissions. - This week is the deadline for ordering the Storm Hawks Special Edition through Diamond. Please go to your local comic book store and order! - Beach CS and DMF Comics are working on another comic book to be released tentatively in September. To be revealed soon! Here's a couple of trailers that I have been working on. Both were released this week at Comic Con International. Storm Hawks Comic Signing Event at The Watcher Comics, July 24-26 during the Beach Jazz Festival! PRLog (Press Release) – Jul 08, 2009 – The Storm Hawks are coming to a comic store near you! In July, Storm Hawks will be available for order through Diamond Comic Distributors and Haven Distributors for the direct comic book retail market. The books will arrive in comic book stores in September. The order codes for the Storm Hawks Special Edition are: through Diamond JUL09083, through Haven STOHBEA001. “We want to give fans the best comic book experience with Storm Hawks as well as reach new fans who haven’t seen the show.” says Jason Park, publisher of DMF Comics. Storm Hawks has been seen in Canada through YTV and in the US through Cartoon Network. It first aired in 2007 and is currently in it’s second season. The Special Edition Comic Book will feature three Storm Hawks stories including the origins of the Dark Ace. An all star gallery of pin-ups from some of the best talent in the animation and comic book industry features: Mike Kunkel (Hero Bear and the Kid), Sean ‘Cheeks’ Galloway (Spectacular Spider Man), Marcio Takara (The Incredibles), Sanford Greene (Marvel Adventures Spider-Man), Marcus To (Fathom), Randy Green (X-Men) and more! 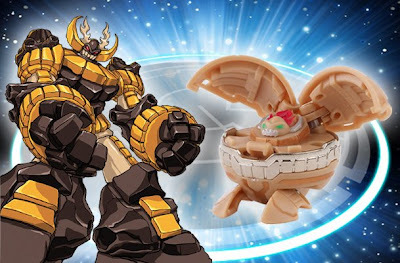 Spin Master has released this image of Vandarus at Bakugan.com! Beach CS created many images for Bakugan this past spring. This is the first image released! Illustrated and colored by Marvin Mariano. Through Amazon, or if you don't want to pay shipping, you can buy it at your local comic book store in September. Make sure your store orders it in July. Arriving in stores in September! Just type in your zip/postal code.